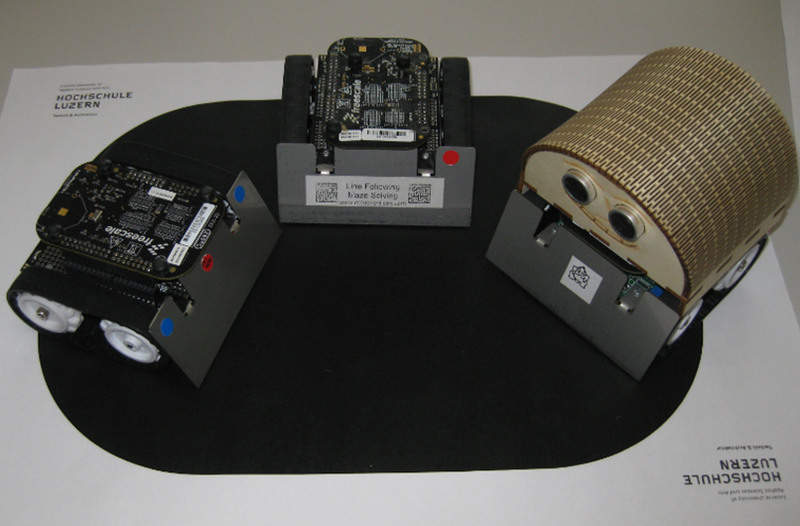 The two robots on the left are based on the Pololu chassis and base board (see “The Freedom Zumo Robot“). 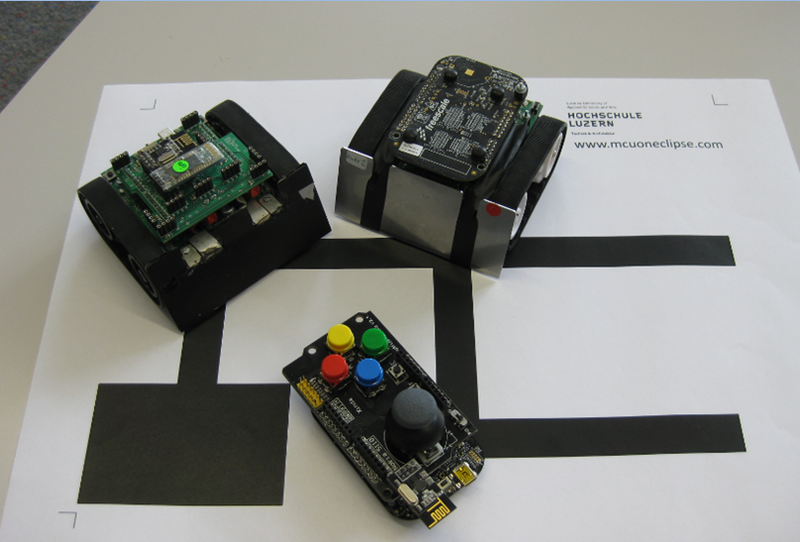 The one on the right with the Ultrasonic sensors is based on our own University board (see “Zumo robot assembled“). The third generation robot (with the green PCB on the left) has Bluetooth and wireless connectivity using the nRF24L01+ transceiver. So it can be controlled remotely with an extra FRDM-KL25Z board and a Joystick shield (shown in the middle).:-). You will find the robots in action at the Freescale booth, Pavillion G, booth 8, 9 and 10. You will find other boards like the FRDM-KL46Z, the FRDM-K64F, the new MULTI2-B sensor board and the UDOO NEO with a Photobooth demo. So if you have a chance to be in Rome, say “hello” to the robots :-). Rome Maker Faire 2015: http://www.makerfairerome.eu/en/, Pavillon G, booth 10. Third generation robot with on-board Kinetis K22F: Zumo Robot with WiFi and GPS and New Sumo Robot Assembled, and looking good! This entry was posted in ARM, Boards, CPU's, Embedded, FRDM-K64F120M, Freescale, KL25Z Freedom Board, Robots and tagged FRDM-KL25Z, FRDM-KL46Z, freedom board, Freescale, KL25Z Freedom Board, Maker Faire Rome by Erich Styger. Bookmark the permalink.